Help celebrate National Estuaries Day at the Florida Maritime Museum. National Estuaries Day promotes public awareness, the importance of estuaries and the need to protect them. 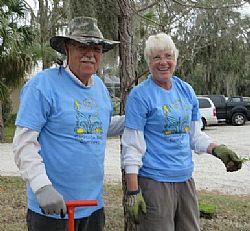 Sarasota Bay Estuary Program (SBEP) is recruiting Bay Guardian volunteers for a planting on September 27th. Partners for this event include the Florida Maritime Museum and Around the Bend Nature Tours. The planting will take place at the Florida Maritime Museum in Cortez. This project is being funded by the SBEP Bay Partners Grant Program. We will be planting Florida native plants in the shallow water around their pond and creating a butterfly garden. In order to participate you MUST wear appropriate footwear—closed-toed shoes are required. The Maritime Museum is located in the historic fishing village of Cortez. The museum sits on almost 4 acres of land showcasing the maritime history, culture and heritage of Florida. By installing Bay friendly landscaping this volunteer event will help promote the health of the Bay. This event is suitable for ages 6 and up. Please wear hat, sunscreen, closed-toed shoes are required (old tennis shoes work great), clothes that can get dirty and work gloves. Bring a trowel if you have one. Please bring a reusable water bottle to help reduce our plastic pollution. Bay Guardians shirts will be available for all volunteers! If you already have one please wear your shirt to the event. Lunch will be provided for all volunteers after the planting is done! Questions? Contact Camille Boffa at (941) 955-8085.